Looks like Hydrospyche to me, most likely H. betteni. However, if you've keyed it out to Phryganeidae, I'm probably wrong. Posts: 1681 My first impression was that the wing didn't have quite the degree of recurve typical of Hydropsyche. The photo of the maxillary palp seems conclusive in ruling out this genus (the fifth segment would be much longer in Hydropsyche). The pattern of spurs on the legs seems to follow Limnephilidae (1, 2-3, 4) rather than Phryganeidae (2, 4, 4); and the five-segmented palp would be female (in either family). Size, color, habitat, and season all seem to suggest Limnephilus (Summer Flier Sedge) as the likely genus to me; but the Limnephilidae are known as an "unruly" family, and some caddisflies just confuse the hell out of me. 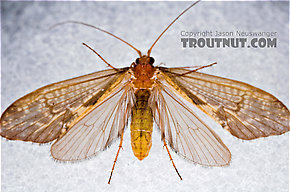 Re: Anyone recognize this caddisfly?